Planning, or reasoning about actions, is a fundamental element of intelligent behavior--and one that artificial intelligence has found very difficult to implement. The most well-understood approach to building planning systems has been under refinement since the late 1960s and has now reached a level of maturity where there are good prospects for building working planners. 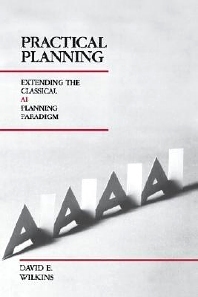 Practical Planning is an in-depth examination of this classical planning paradigm through an intensive case study of SIPE, a significantly implemented planning system. The author, the developer of SIPE, defines the planning problem in general, explains why reasoning about actions is so complex, and describes all parts of the SIPE system and the algorithms needed to achieve efficiency. Details are discussed in the context of problems and important issues in building a practical planner; discussions of how other systems address these issues are also included. Assuming only a basic background in AI, Practical Planning will be of great interest to professionals interested in incorporating planning capabilities into AI systems. 1.6 How Hard is Planning? 12.2 Who is in Control?